In 2019, Aston Martin will embark on a completely new adventure by entering the prestigious DTM series. The British company's first touring car campaign fills the void left by the withdrawal of Mercedes-Benz at the end of the 2018. Like Mercedes-Benz before them, Aston Martin also called on the expertise of HWA to develop their DTM car, which will be raced by the Swiss R-Motorsport team. Built to the latest 'Class One' regulations, Aston Martin's Vantage DTM is built around a carbon-fibre monocoque, which is clothed in a silhouette style body. New for the 2019 season is the mandatory two-litre, turbocharged four-cylinder engine. To balance the field, the power is restricted to around 610bhp, while the maximum engine speed is set at 9,500 rpm. This power is transferred to the rear wheels through a paddle-operated, six-speed transaxle. 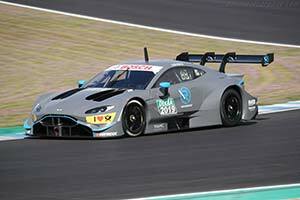 Reportedly developed in just 90 days, the Aston Martin Vantage DTM first ran at the Jerez test in early March of 2019. R-Motorsport will field four cars with the driver line-up headlined by former DTM Champion Paul di Resta.